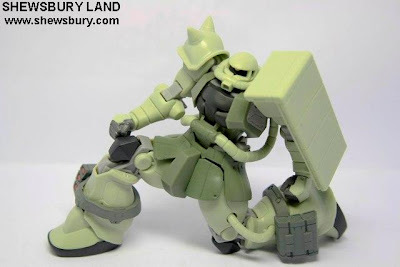 This is Special Creative Model Ex: Zaku II produced by Banpresto. For 1,450 yen (about SGD 23.00) before adding whatever shipment charges, this item offer great value for money as well as lots of fun when you play with it and sure looks nice as display items as well. 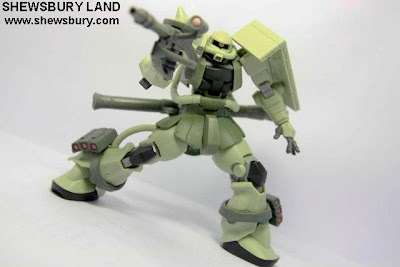 Apart from this Zaku II, you can also get the Gundam, the Gouf and the GM, though I cannot find the specific SCM Ex: GM from HLJ's website, I believe the Hummable Model No. 4 - GM is basically the same item with different packaging. 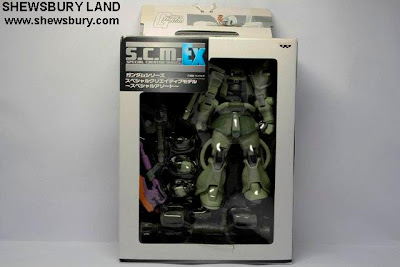 And if you're interested, we also have the SCM Ex: Gouf, you can read the review in this link. Out of the box, you will get the figure, a machine gun, a bazooka, a heat hawk and missile pods mounted on both legs. Very neat and simple and yet satisfying. Articulation is very good, you can do this kneeling pose or many other action pose that you could think off in line with the capabilities of this figure. Overall, this is a very fun toys or figure to have and to play with and also looks good for a display item, at such a cheap price, I think this item worth every single cents you spent on it. It has to be noted that apart from the color and the missile pod, this item is basically the same as the SCM Ex: Char's Zaku II that we reviewed here in October 2009. No doubt that Banpresto may intended this items for those young children and thus there is no sharp objects included but as far as adult collectors concern, this is damn good to pass. If you are a big fan of Zeon or MS from the classic Gundam anime, go grab them if you can still get it from any online or local toy retailers. 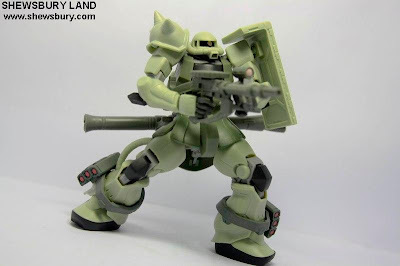 Now I wonder, will Banpresto also produce the Zaku I, the Dom, the Rick Dom, the Gelgoog or maybe the Zeong for this SCM Ex action figure series in the future? That would be interesting. No doubt that as GunPla collectors you or we, might already have all those models that I mentioned be it in 1/144 or 1/100 scale model kits but one thing for sure, it is fun to have this SCM Ex figures because you don't have to assemble them anymore, it is ready to play out of the box and the best part is that if you like to carry your figures (or Gundam) for outside activities like outdoor photography session or maybe just for fun during dinner and regular outings, you don't have to worry about missing parts or anything that may be break or ruined due to injuries sustained if and when they fall down to the floor or anything alike. 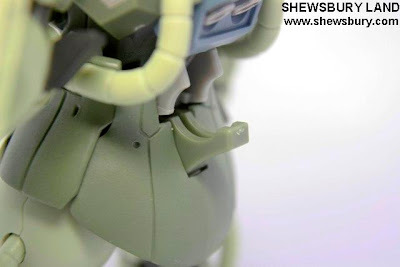 If you haven't already, you can read the review the SCM Ex: Gouf, you can read the review in this link.